Alright, now we’re on to something. “The Bizarro Jerry” and “The Little Kicks” are probably two of the better-known season 8 episodes and for good reason – they’re a lot of fun. 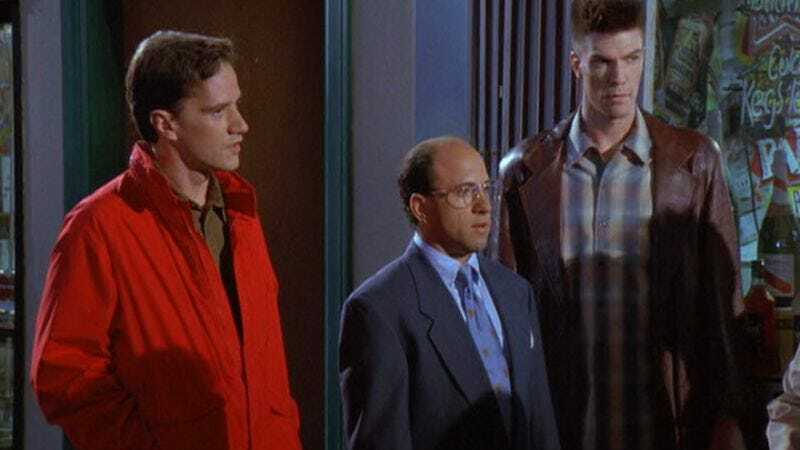 “The Bizarro Jerry” just reeks of a concept that Seinfeld wanted to do forever, given his obsession with Superman, and finally got the chance to once he was fully in charge of the show. That might not be true (Larry David is perfectly prone to wackiness himself) but that’s what I’m gonna go with. The concept is simple stuff – Elaine finds that Kevin (Tim DeKay from last week) and his friends are like a weird mirror group to her friends. But it’s very effectively staged that it works, even once the joke has become totally familiar – the idea of characters having strange doubles is now one of the oldest sitcom tropes in the book. The stagey, intentionally ridiculous way Kevin and his buddies (Gene aka George and Feldman aka Kramer) act out their scenes is why it works. When Elaine gawps at their strange behavior like them being nice to each other, Feldman buying Kevin groceries and knocking on the door, or at Kevin’s apartment, set out the same way as Jerry’s only reversed, it’s like she’s watching a pantomime. My favorite thing that the gang does is how Kevin and Gene look at each other, worried, when Feldman knocks on the door and says “It’s Feldman,” only smiling in recognition when he adds, “from across the hall.” Really, anything that George clone Gene does makes me laugh, because he does it completely silent and with an adorably puzzled look on his face. Like many a good Seinfeld episode, there’s a B-plot nestled in here that feels like the dominant A-plot of another episode, considering what a major meme it became. I refer, of course, to Jerry’s girlfriend with the “man-hands,” and having written that out, that plot description is pretty much complete, which is probably why it’s a B-plot. Jerry dates a girl, she’s quite pretty, but her hands are unusually large (and played by actor James Rekart, according to Wikipedia). This freaks Jerry out, and so the relationship does not lead to marriage as you might have thought. That’s it! That’s the whole thing! But like many a Seinfeld meme that found its way into popular culture, writer David Mandel just hit on the key phrase – “man-hands” – and image – her tearing the bread apart – to burn the thing into your memory. Simple, but effective. Finally, George uses a picture of Jerry’s large-handed girlfriend, coupled with his sob story about Susan, to get in with attractive ladies who party at meatpacking plants, because the idea that he was engaged to a pretty woman is apparently enough to attract their attention. Here’s my problem with this plot – Susan is way hotter than Jerry’s lame man-handed girlfriend! Would a picture of Susan NOT work? I like the story itself – George immediately shoots himself in the foot by dumping the girl who introduces him to the models, classic Costanza behavior – but the premise bugs me. Susan’s hot, you guys. EDIT: Through some bizarre note-taking mishap I wrote down Kevin's name as "Reggie" which is, of course, the alternate diner they go to that we've seen several times before. I wrote down "Elaine meets Reggie at Kevin's" and that led to this chaos. Now corrected, sorry about that! So when I say this episode is well-known, it’s really for one thing – the “full-body dry-heave set to music” that is Elaine dancing. Julia Louis-Dreyfus is funny doing just about everything, but her manic kicking and finger-pointing and hair-flipping is something to behold. It feels almost like they could have done the episode with her dancing never shown on screen, just left to the viewers’ imagination, and you wouldn’t have imagined something as bad as this. The rest of the episode, written by Spike Feresten, is a little more ordinary. Elaine’s dancing is so insane that everything else can’t hope to live up to it, really. But it’s especially disappointing to have the plot about her dancing be that people at work don’t respect her as much. Who cares! So they snigger at her! She already put the urban sombrero on the cover of their catalogue, it’s not as if she’s ruling with an iron fist over there. Elaine’s bootleg tape of her dancing going “viral” on the streets of New York is a little funnier, but really, I don’t think any plot can live up to the sight of her kicking. Jerry’s foray into bootlegging movies is more fun, although Jerry’s prima donna behavior gets very silly and out of character. 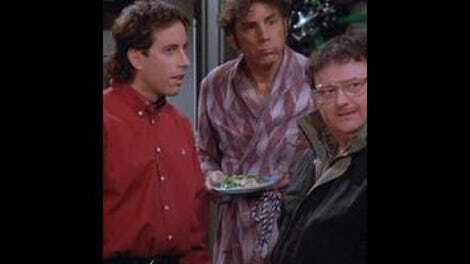 Near the end of the episode, even though he’s been insisting that the reason he won’t shoot movies is because he needs fellow cameramen and audio hookups so he can talk to them, he quickly slips back to the Jerry from the start of the episode, afraid of bootlegging because it’s illegal. The whole “Jerry as artiste” portion of the episode feels too put-on considering how frightened he was by Brody at the start of it. But, it’s still pretty funny to watch, especially since Jerry acting that way feels pretty rare for this show. What I like about “The Little Kicks” is that it largely succeeds in tying together a bunch of very disparate plotlines. It’s nothing like the show’s heyday but you’ve got Jerry bootlegging movies, Elaine thinking George is a “bad seed” because of the reaction to her dancing, and George turning into a bad boy with a ’68 GTO, and it all comes together very nicely (with George in the big house and Jerry walking around free as a bird). George’s plot is also very silly but the structuring is a lot stronger. His bad-boy act is pretty heightened (as is Elaine’s angry-mom act) but it makes a certain sort of sense. The whole thing builds to a logical conclusion (George decides to bootleg movies to impress his lady friend) and a classic George reversal (him sobbing in prison over a fine). “Why’d the policeman have to yell at me like that?” Plus, then we’re treated to a brief but exciting visit from Frank Costanza, who almost immediately gets in a fight with Elaine and she drops him “like a bag of dirt” (they should have shown that moment). Who can argue with that? Kramer’s subplot in the Bizarro Jerry about getting a job isn’t much – the trope of Jerry turning into an angry housewife is a tired one. But there’s no doubt that his “TCB” line gets a laugh out of me every time. Plus his briefcase full of crackers. She's mostly baffled by Bizarro Man. "Is he black?"